Over the years I have refurbished many older KBB and KB&B pipes. I have kept many of them and others I have passed on to other pipemen and women. The KBB and KB&B stamping on these old timers are stamped in a cloverleaf on the side or top of the shank of the briar pipes. In more recent years the KBB and KB&B stamping is no longer present. Kaufmann Brothers and Bondy was the oldest pipe company in the USA, established in 1851. The Club Logo predated Kaywoodie with the “KB&B” lettering stamped within the Club, and a multitude of KB&B lines were in production long before “Kaywoodie” first appeared in 1919. I have several of these old timers including a Borlum that was made before Kaywoodie became the flagship name for pipes from Kaufman Brothers & Bondy (KB&B). It was made before the Kaywoodie invention of the “Stinger” was added, and even before shank logos, model stamps and other features invented by Kaywoodie came to be standards of the pipe making industry. It comes from the time when names like Ambassador, Heatherby, Melrose, Suez, Rivoli, Cadillac and Kamello dominated the pre-Kaywoodie scene. Borlum is one of those vintage names. That information helps date pre-1919 KB&B pipes. There is still a long history following that for which I wanted further information. I was left wondering about the variations in the stampings on the Kaufmann Brothers and Bondy pipes. I had seen a pattern in that the Yello-Bole pipes made by Kaufmann Brothers and Bondy that were stamped without the ampersand (KBB) and other pipes made by them that had the ampersand (KB&B) and wondered about whether I had stumbled upon something. I had no idea why there was a variation in stamping. I decided to do some digging online to see if I could get more information regarding this variation. The purpose of this article is to collate what I found in order to provide some guidelines on dating the older pipes and to differentiate between the two stampings. 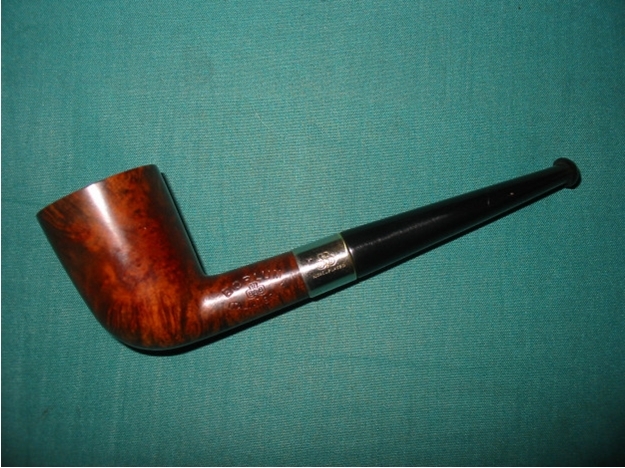 In the past when I had questions about KB&B pipes, Yello-Bole pipes and KW pipes I have found that the Kaywoodie Forum http://kaywoodie.myfreeforum.org/ftopic13-0-asc-0.php has been an invaluable source of information on the brand. The information found there on the KBB and KB&B pipes is very useful. Dave Whitney has an article on the topic of KBB pipes. I will summarize what I have found there to help with my search. I have several older Yello-Bole pipes with the shovel drinkless mechanism and the KBB-in-a-clover logo on the left side of the shank (not KB&B). These also have the yellow circle on the stem. From what I can ascertain from Dave’s information, pipes with this configuration seem to have been produced between the years of 1938-42. The lack of the aluminum stem ring and the drinkless mechanism that came out in the later period of KBB history 1945-50 (World War II) point to the earlier period. 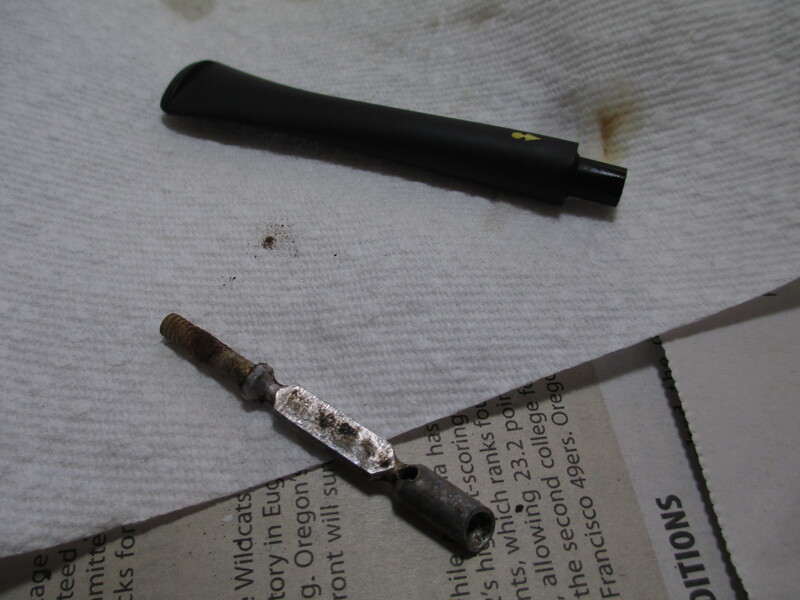 The shape/style of the drinkless mechanism helps to date the pipe. Let’s summarize what we know so far. The Kaywoodie stamp appeared in 1919 thus any pipes with the KB&B in a cloverleaf stamped on the shank pointed to a pre-1919 pipe. From 1919-1938 the combination of the KBB stamping and the shovel mechanism in the tenon help date those pipes. The metal drinkless attachment came out in 1945 and following. I have KB&B pipes and KBB Yello-Bole pipes from this early era. Reading further led me to ascertain that the KBB in a cloverleaf stamp dates a pipe back to the ’30’s. I also learned that the 4 digit shape numbers stamped on the right side of the shank are older than 2 digit ones. The pipes with the logo inlaid on top of the stem are older than ones that have it on the side. I learned that in the past, Kaufman Brothers and Bondy would sort shipments of briar and send the culls to be used for Yello-Boles, meaning they got some quality briar. One fellow on the web believes that is why Yello-Bole pipes tend to be smaller over all, working around flaws. He also said that he thinks calling these pipes Kaywoodie seconds is a bit of a misnomer, being that Kaywoodie was one of the largest briar purchasers in the world at the time (’20’s-50’s) and got some fantastic wood. Armed with this bit of information on the brand I did some more research and came across the SM Frank website http://www.smfrankcoinc.com/home/?page_id=2. There I found a wealth of historical information on Kaywoodies, Yello-Boles and the merger between KBB and SM Frank and later Demuth. It was a great read and I would encourage others to give the website a read. The information in the next paragraph was condensed from that site. I found confirmation for the statement above that the Yello-Bole line was an outlet for lower grade briar not used in Kaywoodie production. Yello-Bole’s were introduced in 1932 and manufactured by Penacook, New Hampshire subsidiary, The New England Briar Pipe Company. Advertising from the 1940′s, pictures the Yello-Bole “Honey Girl” and urges the pipe smoker to smoke the pipe with “a little honey in every bowl.” Honey was an ingredient of the material used to line the inside of the bowl. It was said to provide a faster, sweeter break-in of the pipe. I went hunting further to see if I could find information on establishing dates for Yello-Bole pipes and found that there was not a lot of information other than what I had found above. 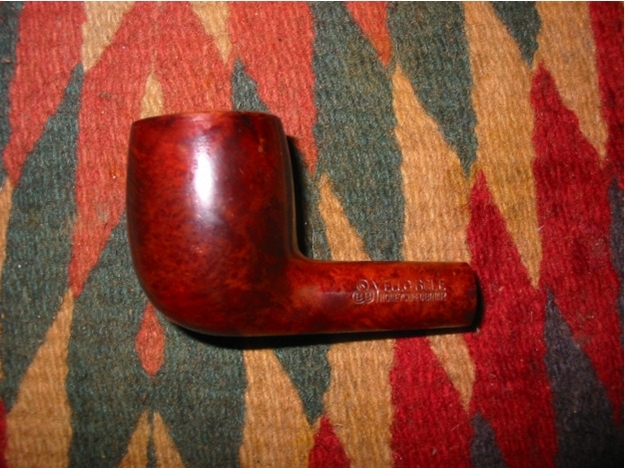 Then I came across this link to the Kaywoodie Forum: http://kaywoodie.myfreeforum.org/archive/dating-yello-bole-pipes__o_t__t_86.html I quote the information I found there as it gives the only information that I found in my hunt to this point. “OK so there isn’t a lot of dating information for Yello-Bole pipes but here is what I have learned so far. – If it has the KBB stamped in the clover leaf it was made 1955 or earlier as they stopped the stamping after being acquired by S.M. Frank. – From 1933-1936 they were stamped Honey Cured Briar. – Pipes stems stamped with the propeller logo they were made in the 30s or 40s no propellers were used after the 40s. – Yello-Bole also used a 4 digit code stamped on the pipe in the 30s. – If the pipe had the Yello-Bole circle stamped on the shank it was made in the 30s this stopped after 1939. 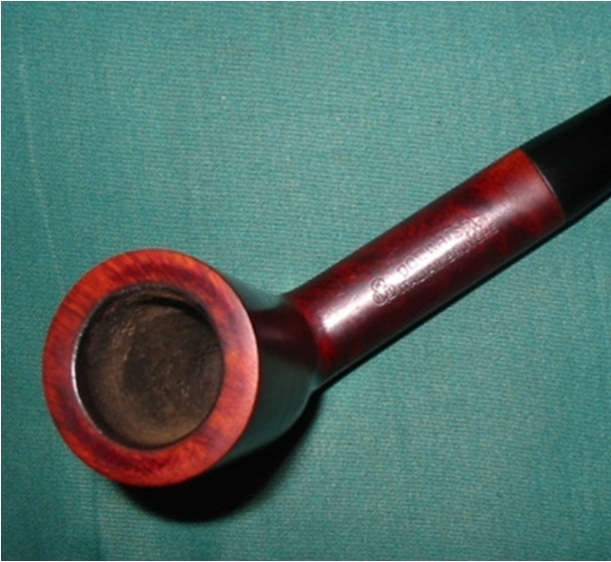 – If the pipe was stamped BRUYERE rather than briar it was made in the 30s. The pipes with propeller logos appear to be made in the 1930’s or 1940’s. 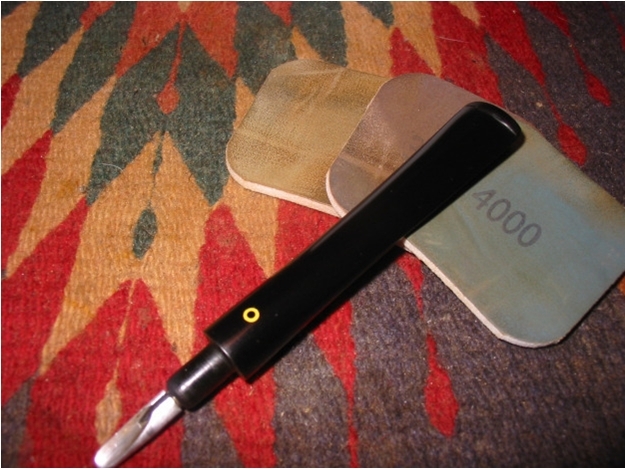 The pipe with the yellow circle logo imprinted into the shank of the briar was made in the 1930’s. Those with the brass O seem also to have been made in the 1930’s. That is all the information I have gathered to date. I don’t have anything on the multitude of stem stampings or any other age indicators. In summary, it seems that the stem logos, the stamping on the shanks of KBB and KB&B, the type of stinger apparatus in the tenon as well as aluminum decorative trim all are a part of dating the KBB and KB&B pipes. From the final paragraph above I have the answer to my question on the difference in the ampersand or lack of it – until 1936 the KBB and KB&B in a cloverleaf were stamped on the shanks of pipes made by Kaufman Brothers and Bondy. After 1936 that stamping disappeared and was replaced with the various Yello-Bole and Kaywoodie designation stampings. If anyone has more definitive information or other methods of determining date please feel free to post it in the comments below and I will add them to this piece. If you would like to have a look at the KBB pipes that I have restored do a search on the blog for Kaufmann Brothers & Bondy, KBB, Yello-Bole and Kaywoodie pipes. The search will bring up quite a few of the pipes that I and other contributors to the blog have posted here. 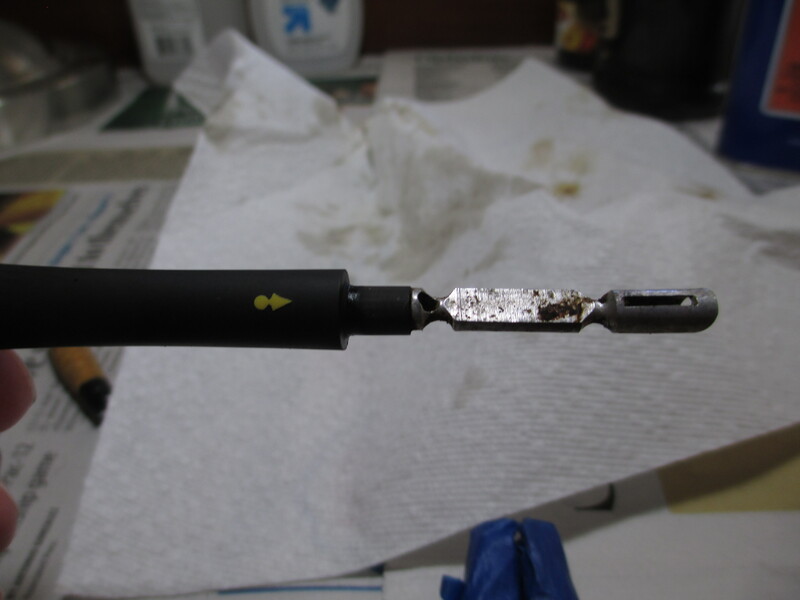 I received two photos of the stinger apparatus that Andrew Selking removed from the KBB Doc Watson that he wrote about here. I am including them here. We both think that they predate the shovel like apparatus that I picture above. This entry was posted in Pipe and Tobacco Historical Documents and tagged Dating KBB and KB&B pipes, History of KBB and KB&B pipes, Kaufman Brothers and Bondy pipes, KB&B, KBB & KB&B pipe history, KW pipes, Yello Bole pipes on December 15, 2014 by rebornpipes.